Victoria, BC - Victoria, British Columbia’s capital, has earned its culinary chops; it was home to Canada’s first brewpub, Canada's first chocolatier, Brewery and the Beast started in Victoria, so did the Victoria Meat and Cheese Festival, and of course Culinaire. Oh! And did we mention it boasts Canada's oldest Chinatown? On May 5, 2019, the Highlanders FC are proud to announce the first Drums 'N' Kicks Chicken and Ribs Night to take its place alongside these culinary accomplishments. 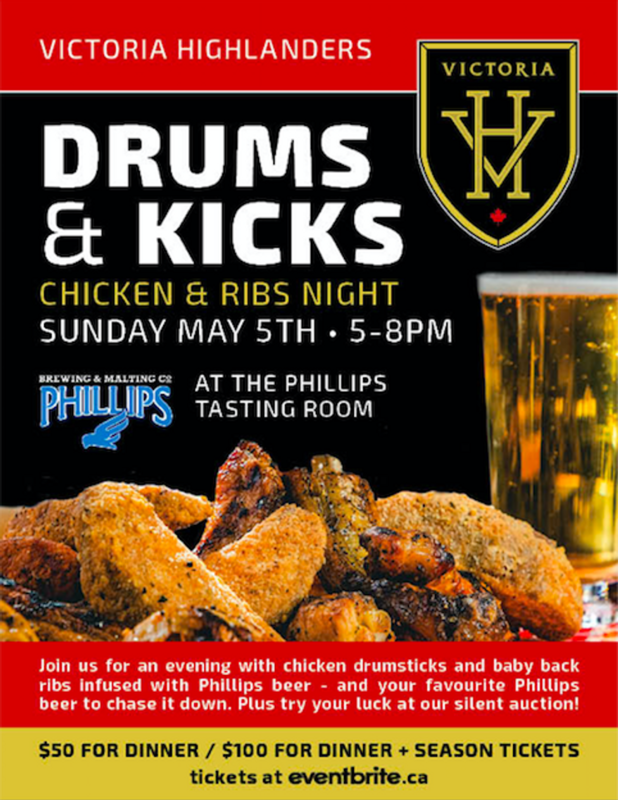 Serving as a kick off launch event, the Drums 'N' Kicks night will feature an evening of chicken drumsticks and baby back ribs, all infused with Phillips beer plus all the fixings at the new Phillips Tasting Room. Food courtesy of the Sticky Wicket Pub. "We wanted to change things up with our launch event this year," stated Highlanders co-owner Grant Olson. "Not only showcasing the players and team that will be competing with the Highlanders in 2019, but also showcasing the wonderful craft beer selection Phillips Brewery has to offer while tipping our hats to the amazing foodies and food scene Victoria has." There will be limited capacity with only 100 tickets going on sale. Fans of Highlanders FC - read: food and beer - will have the chance to purchase tickets for $50, or $100 which will also includes season tickets to the upcoming Highlanders FC USL League Two season.